Harissa is one of the basic flavorings in Tunisian cuisine – a combination of French, Arabic, Mediterranean and the Middle East. In this recipe, its spicy flavor is offset by the sweet honey. Rubbed on the chicken, then roasted, the pan drippings are used to make a delicious glossy sauce. 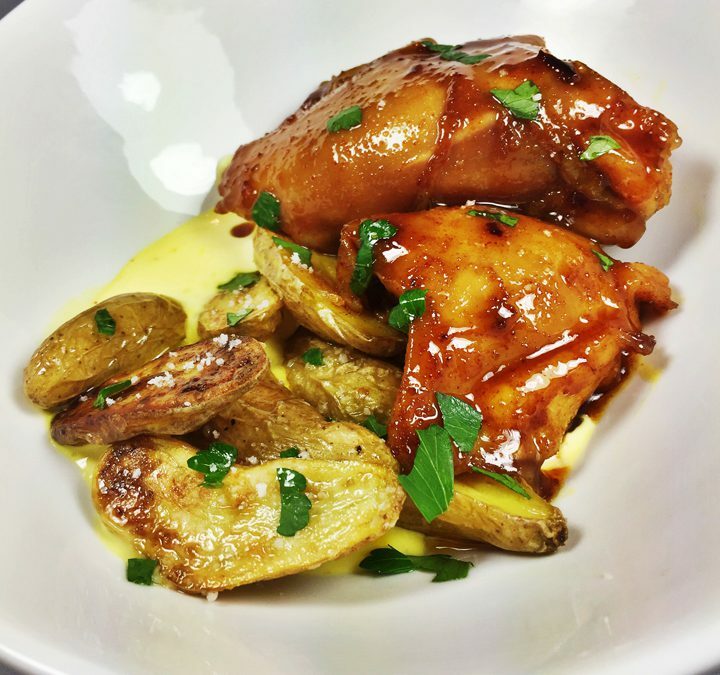 Add contrasting flavors to the dish with smoky potatoes and lemon aioli. In a bowl combine ½ cup honey, ½ cup olive oil, harissa, paprika, turmeric, lime juice and kosher salt. Mix together until well combined; add the chicken, rubbing the mixture all over the thighs. Place in a plastic bag; add any extra liquid. Seal the bag tightly and refrigerate for at least one hour or up to six hours. Preheat the oven to 375 degrees. Heat an oven-proof skillet to very hot. Add 1 tablespoon of olive oil then add the chicken still covered in the rub. Discard any remaining rub or liquid in the bag. Sear for 3 minutes, turn over the chicken and sear another 3 minutes. Add ½ cup chicken stock to the pan and place in the oven. Bake uncovered for 15-20 minutes or until the chicken reaches 165 degrees. Remove from the oven and remove the chicken from the pan; cover and keep warm. Place the pan back on the stove over medium heat. Add the remaining chicken stock and ¼ cup honey. Cook until the sauce is reduced by half and very thick. Add the chicken back in the pan and turn to coat well with the sauce or brush the warm sauce over the chicken. Serve with the smoky potatoes sprinkled with parsley. Note: This recipe uses a smoking gun to smoke the potatoes. If you don’t have a smoking gun, you can omit the smoking step and use smoked salt in place of sea salt. Preheat the oven to 425 degrees. Cut the potatoes in half, length-wise. Toss in the olive oil and sea salt. Place cut side down and roast 15 minutes. Turn over and roast 15 minutes more. Remove from the oven. If using a smoking gun, place a rack in a deep pan and place the hot potatoes on the rack and cover tightly with foil. Following the directions, use a smoking gun with apple-wood chips to smoke the potatoes. Serve with the lemon aioli sprinkled with sea salt and parsley. Combine the egg yolks, lemon juice, salt, white pepper and Dijon mustard in a blender. Blend on medium high until well mixed. Add the garlic one clove at a time until well combined. Reduce the blender speed to medium and slowly stream the oil in starting with small drops and then increasing little at a time to make sure the oil is well combined.